In recent years, the trend of converting a Photoshop Design (PSD) File to a WordPress theme has grown quite rapidly. Be it a small or a medium or a large, every business today seems to hire a professional PSD to WordPress conversion service provider to get a custom theme for their website. In fact, gone are the times when enterprises used to use free (or even premium) WordPress themes to set up their websites. Today if you notice, you will find many bloggers using a custom WordPress theme developed using a PSD. Below are 10 rock-solid reasons why you also should prefer to choose PSD to WordPress conversion over using a pre-built WordPress theme. The first and foremost reason why you should go with PSD to WordPress conversion rather than using a pre-built WordPress theme is your unique business model, which makes your business stand out from the crowd. Where a pre-designed theme is not able to fulfill all of your business requirements, on the other hand, PSD to WordPress conversion gives you the exact look, feel and functionality you want for your website. Also, chances are the theme which you’ve chosen to use is already being used on some other websites. In such a situation, custom website design is the need of the hour. There are several software available in the market, which automatically convert a Photoshop design file to a WordPress theme but factually, none of them can produce as high-quality code as hand-coding does. In PSD to WordPress conversion, your theme is hand-coded by professional designers who have the ability to maintain quality in coding. This semantic approach to web markup makes your website search engine friendly and load fast. Most of the pre-built WordPress themes don’t have a pixel perfect design, which is as vital as having the semantic markup. Since the conversion of a Photoshop file is done via handcrafted chopping technique, you can be sure that you’ll get a pixel perfect WordPress theme. 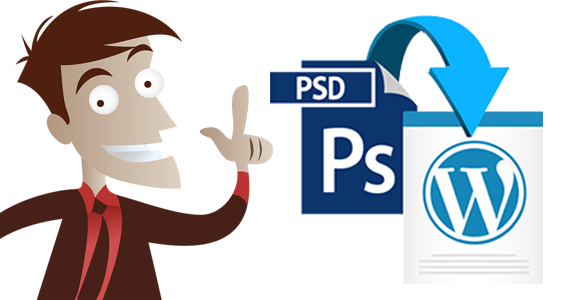 Despite the slicing of PSD files during the conversion process, PSD to WordPress coders delivers you a pixel perfect code in relation to Photoshop design. Just because the theme demo is working properly does not necessarily mean the theme is worth to download or purchase and use. It also doesn’t mean that the theme will render properly in all old and modern browsers. To be able to usable and accessible across all kinds of devices and web browsers, a WordPress theme must adhere to the latest W3C (World Wide Web Consortium) and WordPress coding standards, which is possible only via PSD to WordPress conversion. This is the main reason why many WordPress sites get fail to become successful and popular. Most of the WordPress themes lack cross-browser and cross-device compatibility, which makes them almost useless. In contrast, a WordPress theme built using PSD not only incorporates pixel perfection but also is thoroughly tested on different operating systems and web browsers to make sure it’s working fine everywhere without any hindrance. Generally, people download or purchase a theme and then upload and activate it via their WordPress Dashboard. Since the theme is not developed in accordance with their business requirements, they are required to add or remove different things from their theme to make the site suitable for their business. This is a very time consuming process. On the other side, when you get your PSD converted to a custom WordPress theme, you don’t need to worry about making customizations to your theme. Furthermore, professional WordPress developers deliver theme conversion services at highly reasonable prices. Another great feature that PSD to WordPress conversion process offers is scalability and flexibility. As your business achieves new milestones, your website will too. Without messing with the actual code and functionality, you can keep adding posts and pages to your website. Moreover, the WordPress platform itself is highly flexible and scalable. With a few clicks of the mouse, you can add any required functionality anytime with a variety of plug-ins offered. Unlike a static HTML site, a website built using PSD to WordPress conversion doesn’t require you to use HTML and FTP software. That’s because everything from updating themes to adding new content is built-in to the WordPress itself, which is a huge advantage for you especially if you’re a novice. With a few clicks from your WordPress dashboard, not only you can update your site theme to the latest version but also can add new content as per your requirements. When you hire a professional PSD to WordPress theme conversion service provider, you get the surety of reliable after delivery support and maintenance services. That means if unfortunately you get stuck anywhere, you can ask your service provider for their assistance. Needless to say, their dedicated professionals will always be ready to help you. Last but certainly not least, when the development of your website is handled by professional developers, you can focus your attention on what really matters to grow your business. There are many things – like marketing, client meetings and strategy planning – which you need to devote your time and effort to. Hence, hiring a PSD to WordPress conversion service provider seems to be an intelligent option.